Decades ago, before “aging in place” became a movement, a small group of residents in rural Leelanau County began a conversation. That led to a plan: a grassroots network of volunteers and basic services for the elderly so they could remain in their homes as long as possible. 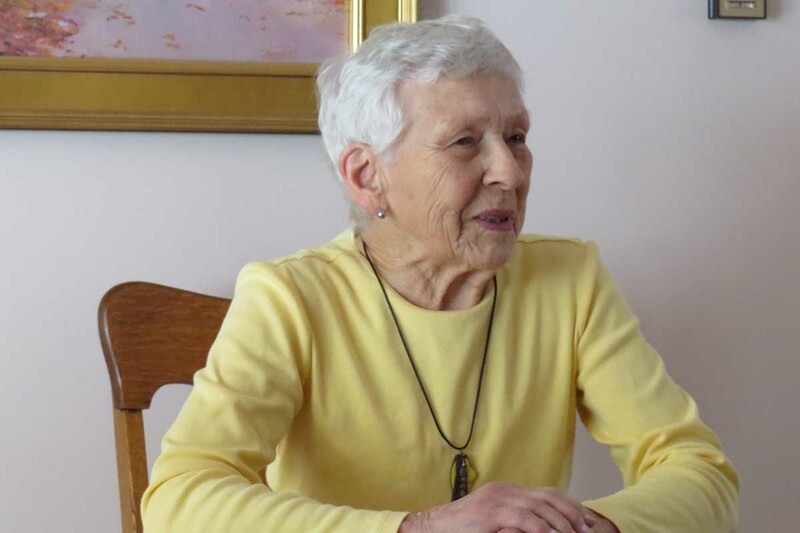 More than 20 years later, Pauline McClure, 91, is still in her home in Northport, a pretty beachfront town popular with retirees north of Traverse City. That’s in no small part due to ShareCare of Leelanau Inc., the nonprofit that grew from those discussions. “It’s almost a lifesaver,” McClure said. McClure was a ShareCare charter member in 1994. She’s served on its board, as board vice president and has given her time driving members to dental or medical appointments, visiting the lonely or taking meals to those in need. Now she’s on the receiving end. A couple years ago, she fell and bruised her left leg, which led to infection and surgery. After her release from the hospital, ShareCare’s nurse came to her home to change her dressing. Members brought meals. McClure now depends on a volunteer driver from the organization to take her to doctor appointments in Traverse City 30 miles away. “When we were younger, we said, ‘We’ll never need that.’ Well, now I’m the one having to ask for help once in a while,” McClure said. There’s another name for what ShareCare does ‒ what’s become known nationally as the “village movement” that now counts 230 like-minded programs across the United States, with another 130 in development. Officially the Village to Village Network, it traces its origins to a Boston nonprofit called Beacon Hill Village that opened in 2002 – eight years after network member ShareCare was founded on similar principles. Other Michigan nonprofits are exploring establishing something similar, though none has taken it as far as ShareCare. In the meantime, the graying of Michigan’s population is only going to accelerate. In 2010, those over age 65 were just under 14 percent of Michigan’s population. That’s expected to climb to more than 23 percent by 2040. The share of residents over age 85 is projected to more than double from 2015 to 2045. The needs could be especially acute in rural Michigan, which is considerably older than the state as a whole. Michigan has 11 counties with a median age over 50, tied with Montana for most in the nation. All are in the northern Lower Peninsula or Upper Peninsula, led by Alcona County with a median age of 56. Leelanau County’s median age is 51. By comparison, the state’s median age is just under 40. Transportation and access to medical services have long been a problem for the elderly in these sparsely settled regions. As their number climbs, that could strain an already fragile safety net. “It is a huge need in northwest Michigan,” said Bob Schlueter, executive director of the 10-county Area Agency on Aging of Northwest Michigan. “We have a lot of quality doctors up here but if you can’t get to the doctor, it doesn’t do much good. Area Agency on Aging Executive Director Bob Schlueter: Senior access to transportation and medical care is a “huge need” in rural northwest Lower Peninsula. In 2000, Michigan was the 22nd youngest state in the country based on the median age of its population – 35.5 years. By 2013, Michigan had fallen to the 42nd youngest in median age. Demographic expert Kurt Metzger said Michigan’s rural counties suffer from the double whammy of being older as they lose younger residents to other states and counties within Michigan. Rural counties in the U.P., northern Lower Peninsula and southern tier of Michigan all recorded population losses from 2010 to 2016. “It’s a Catch-22. The rural places are aging and there is less and less for young people to do, so they are tending to leave,” said Metzger, director emeritus of Data Driven Detroit and the mayor of Pleasant Ridge. Given these trends, Schlueter of the Area Agency on Aging expects more organizations like ShareCare to form in the future. ShareCare is not designed to replace fundamental health care resources like Medicare, Medicaid or community agencies like Michigan’s 16 Area Agencies on Aging that coordinate and provide additional resources for the elderly. But it is structured to plug gaps in care or service that might make the Those age 70 and under pay $400 a year, a fee that rises to $500 a year for age 71 to 80 and $600 a year for age 81 and over. The fees give members access to a variety of services, most provided by member volunteers. They include in-home visits and health care planning from the organization’s part-time nurse; respite care for members taking care of a spouse, and access to equipment including walkers, wheelchairs and bedside commodes. Volunteers will help with meals when members need them. ShareCare also keeps a list of reliable home repair contractors. Volunteer members drive members to medical appointments as well as the grocery store, hair salon or to join friends in a game of cards. Volunteers also stop in at the homes of those who simply want company. And many members said they value their volunteer efforts as much as any help they might receive down the road. Leelanau County resident Barbara Coye, 85, said that was a core principle as ShareCare began to take shape in the early 1990s. Coye and her late husband, Bob, had recently lost parents and they wanted to lessen the care-taking burden for their children they had shouldered with their parents. The Coyes – and two other couples with similar experiences – began those early conversations about a new way to help the elderly remain independent. “It’s a membership organization. We wanted members to feel like they were a part of it and that would help them want to volunteer,” Barbara Coye said. The Coyes traveled to Maryland in 1991 to visit a program called Heritage Harbor Health Group in Annapolis, where they picked up many of the ideas that would become ShareCare. Organizers hoped that 200 members would sign up. By the time it opened in 1994, twice that many had joined. Barbara Abbott and her husband, Larry Hauser, moved to Leelanau County from the Lansing area a dozen years ago. Abbott, 74, a retired linguistics professor at Michigan State University, said she’s been a volunteer ever since. “I don’t mind volunteering at all. It’s fun to meet people,” she said. Abbott is responsible for keeping tabs on member needs in one of four districts in the county. Hauser is a leader in another district. Abbott recalled a single elderly woman she regularly picked up a few years ago. 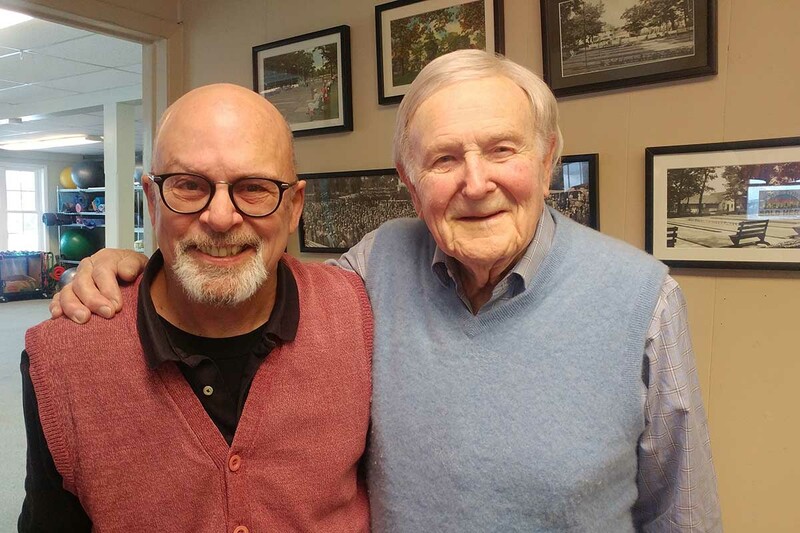 Hauser, 68, a former Alma College philosophy professor, has come to know 96-year-old Bob Winnie as he drives him each Tuesday morning to a senior center in Traverse City. Winnie plays pool and then attends a support group there for seniors who lost spouses. These trips are a highlight of Winnie’s week. On one trip a few days before Christmas, Hauser recorded Winnie’s reflections on his life, living alone and what these trips mean to him since he lost his wife, Irene, nine years ago. “I have a car sitting in the garage, a nice car. They said it was unsafe for me to drive,” Winnie said, noting problems with his vision. “I gave up (downhill) skiing two years ago. Last time I went skiing I fell so hard I split my helmet. I decided it was time to give up skiing. With two grown children living out of state, Winnie said, “I have to be by myself all the time. It’s just tough getting old. I’ve been independent all my life and I don’t like to depend on other people but I have to now. Hauser reminded Winnie the center would be closed for two weeks over the holiday season. This is great news! We live in Silver Spring, Maryland and were among the first members of the Silver Spring Village when it started about 6 years ago. We have a second home in Benzie County and are delighted to know that there's a village in the area. Villages provide social events, home help, and volunteer opportunities, along with peace of mind and friendship. Best wishes for your success as you help people age in place.